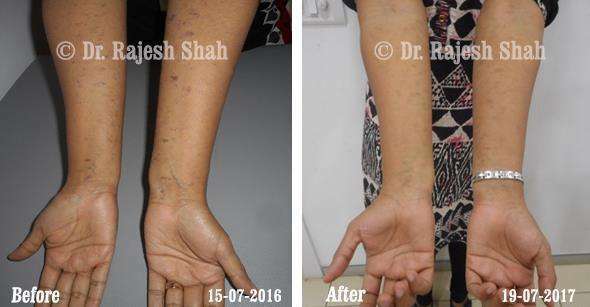 Excellent recovery achieved in Myasthenia Gravis with Dr. Shah’s medications. 67 years old Mr. S. L. P. (Patient Identification Number - 15160) visited Life Force on 4th December 2010. He was detected with Myasthenia Gravis in 2009. He had been taking conventional medicines for the same and was feeling better. He had searched on the internet about homeopathic treatment for his condition and found out about Dr. Shah. He had symptoms of eye strain while driving, feeling sleepy and dull. His one eye had also become small. He had difficulty in swallowing. He experienced muscle weakness. He did not have any major complaints at present. His eye complaints were resolved with treatment from the neurologist. His physical problems were better but his acetyline choline receptor anti-bodies count was constantly increasing, despite conventional treatment. He had been gradually tapering tab Myestin (Pyridostigmine) 60 mg dose, but was taking tab Azoran (Azathioprine) 50 mg thrice daily. Dr. Shah explained him the scope of Homeopathy, we would be able to control the disease progression and possible reduction of conventional medicines. He was also suffering from high blood pressure, cholesterol and heart disease. All these were well controlled with conventional medicines. His diet was vegetarian and appetite was average. He liked spicy food and sweets. He had a habit of cigarette smoking for 35 years, which was stopped a year ago. His thirst was average. He perspired profusely. He was tolerant to both the extremes of temperature. His sleep was sound and refreshing. He retired as a quality assurance consultant of an esteemed company at the age of 60 years. His family consisted of wife, a son and 2 daughters. His wife was a home maker. His son was a software engineer working in a company. Both the daughters were married and settled in different cities. He was meticulous and a disciplinarian. He was punctual and perfect in his work. He disliked imperfection and would get irritable. He was particular about his hygiene and would clean hands often. He was intelligent and hard working. His parents had high blood pressure. His daughter had been diagnosed with underactive thyroid. His case details were studied by Dr. Shah and prescribed few research based medicines. He reported on 18th January with mild improvement. He was able to stop tab Myestin a month ago and none of his symptoms relapsed after stopping it. His tab Azoran was tapered to twice a day since a month. He had been taking it thrice a day before that. He visited on 14th June to report further improvement in eye strain, sleepiness and dullness. He was taking the conventional medicines as per the advice of the doctor. His case was reviewed and medicines were upgraded. He reported on 1st December with substantial improvement in eye strain, sleepiness and dullness. He had responded well to the medicines. He had been stable with the tapering of the tab Azoran twice a day. After 1.5 years of treatment, he reported on 21st June with overall 50% improvement in his complaints. His eye strain, sleepiness and dullness were decreased by 50%. There was no difficulty in swallowing. He reported on 4th December with his complaints being stable. He was not keeping well since past few weeks and so had been irregular with the medicines. His case was reviewed and necessary changes were made by Dr. Shah. He later reported on 4th February. He had an acute episode of dizziness in the end of December and was detected with Malaria. He took conventional medicines for the same. He again had an episode of seizure and unconsciousness for which he was hospitalized for 10 days and underwent the blood tests and scans. He was treated with conventional medicines. During those times he had stopped homeopathic medicines. He was still taking tab Azoran 50mg twice a day. He reported on 4th May with overall 75% improvement in his complaints of eye strain, sleepiness and dullness. His case was reviewed and medicines were upgraded by Dr. Shah. He reported on 12th September with further improvement and feeling much better. He had reduced the dose of tab Azoran to once a day since July. His complaints of eye strain, sleepiness and dullness were mild. He visited on 20th November and was happy to report over 80% improvement. He had stopped taking tab Azoran since 15 days and did not have any complaints. He was happy that he could gradually stop the conventional medicines.